Israeli author David Grossman will give the 20th annual Tenenbaum Family Lecture in Judaic Studies. Photo courtesy of Greater Talent Network. 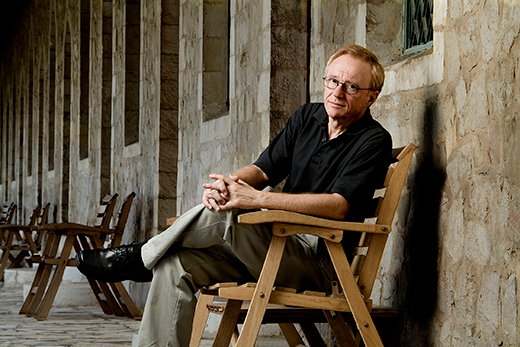 Internationally acclaimed Israeli writer David Grossman will speak on “The Holocaust’s Carrier Pigeon: Reflections on Writing and Memory” for Emory's 20th annual Tenenbaum Family Lecture in Judaic Studies, set for 7:30 p.m. Tuesday, Feb. 28. Presented by Emory’s Tam Institute for Jewish Studies, Grossman’s lecture will address the meaning of the Holocaust today, how we preserve the memory of the Holocaust, and what is the place of art in protecting that memory and the testimony of survivors and witnesses. The free lecture will be held in White Hall, Room 208, followed by a reception and book sale. Grossman will be available to sign purchased books. A leading Israeli writer of his generation, Grossman is the author of eight internationally acclaimed novels, including “See Under: Love” (1986) and “To the End of the Land” (2008), as well as several nonfiction and children’s books. Grossman’s work has been translated into 30 languages. He is the recipient of Israel’s most prestigious literary awards — the Sapir Prize and the Bialik Prize — as well as many international honors. Grossman's writing has examined some of the most difficult aspects of Israeli and Jewish identity, from the struggle with Holocaust memory to the Israeli-Palestinian conflict, which he explores through the lens of human emotion and everyday experience. His new novel, “A Horse Walks into a Bar,” is set in a comedy club in a small Israeli town where an audience awaits an evening of amusement. Instead, they witness a comedian falling apart on stage, and are unable to boo, or whistle, or leave, in awe of witnessing the comedian’s personal hell. Ultimately, the book deals with human suffering, society, truth and love — all of the most surprising and breathtaking aspects of the human condition. Free parking is available in the Fishburne, Peavine and Oxford parking decks on the Emory campus. This year marks the 20th anniversary of the Tenenbaum Family Lectureship in Judaic Studies, which salutes the family of the late Meyer W. Tenenbaum 31C-32L of Savannah, Georgia. Tenenbaum, a native of Poland, arrived in the United States at age 13 knowing no English, and graduated from the Emory School of Law 11 years later. He went on to head Chatham Steel Corporation, now a major steel service center with headquarters in Savannah. The lectureship was established in 1997 by Meyer’s son, Samuel Tenenbaum 65C, and honors the entire Tenenbaum family and its ethos of citizenship and public service, which is expressed through its support of religious, educational, social service and arts institutions across the United States. This year’s program is also made possible by the Waxman Support Fund, which promotes scholarly research, teaching and public programming at Emory on topics related to antisemitism, the Holocaust, and relations between Jews and other communities. The Tam Institute for Jewish Studies brings together scholars and students from a number of different departments and programs at Emory to engage in the interdisciplinary exploration of Jewish civilization and culture. Nineteen distinguished core faculty members offer courses in Jewish religion and thought, history, archaeology, anthropology, language, literature, politics and philosophy. The Institute awards an undergraduate major and minor and provides support for doctoral-level work in Jewish studies, including the new graduate certificate program in Jewish studies. For more information on the lecture and on the Tam Institute, visit www.js.emory.edu.